Girls Night 2 film review. Written and directed by David Teixeira. A film that I really enjoyed the first time I saw it, and many thanks for the director for the advance screening, and once again for the sequel. I'm being honest I'm not a fan of sequels, and they are usually hit or miss, like most bands difficult second album, some succeed such as Godfather 2, Evil Dead 2, then again sometimes we get A Nightmare On Elm Street 2 Freddy's Revenge. 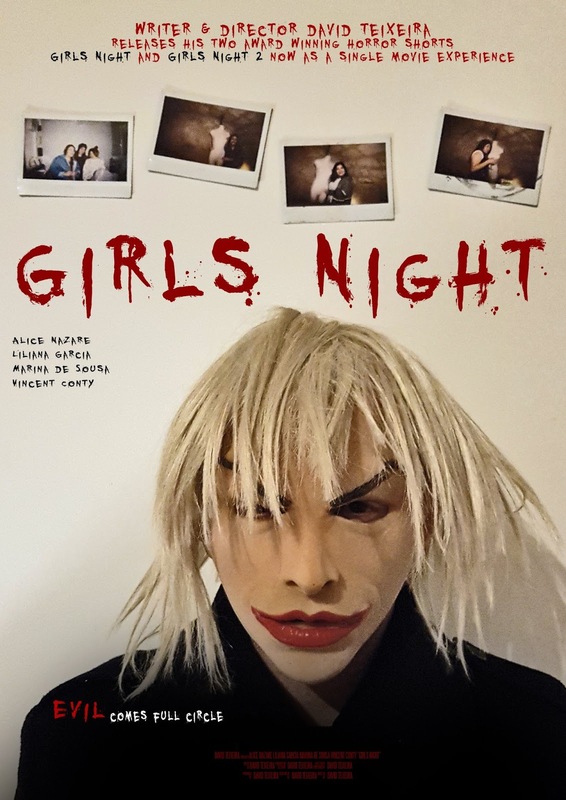 Girls Night 2 is a film that extends the events of the first movie, we see surviver Jess, who is still traumatized from the events of the first movie, and the game of Bloody Mary, seeing her friends butchered by some unseen force. She is having nightmares, seeing her dead friends, and some strange man with a pair of scissors that haunts her. We do have some great scenes in this movie, abet being so short, still manages to up the tension, a credit to director David Teixeira who manages to create tension with such confidence especially the one dream sequence is brilliant to watch. The thing is the director does know horror, he gets it, the tension he creates in certain scenes, we see just enough of the creepy guy with the scissors, but just enough, to tease you into wanting more. The ending is great, and is a surprise, and I'm not giving spoilers. My only criticism of this movie, apart from being so short, is it seems to be a continuing of the original film, like Quantum Of Solace was a continuation of Casino Royale, we don't actually seem to get a sequel, a film instead that would've actually worked just as well in the first film, rather than being a sequel in its own merits. Shame as I had higher hopes for this sequel, it is a well made short film, with great scenes and tension, but the continued story arc is a disappointment, with a different story would've worked better. Then again director David Teixeira is still a talented young man, and maybe now deserves a bigger budgeted film to get his creative ideas on-screen, as he is a great horror director.